I really love these days when I can stay at home. At least for most of the day. I have errands to run later this afternoon. I am pretty sure I can get my home keeping done before I go. OK ready for some pictures? This is the original plot. after working on it almost a whole day, and breaking 2 garden tools, Beloved decided a tiller was in order. This is the yard tractor with the top soil waiting for the tilled ground. Chris, Judy and friend Shawn on the second pass with the tiller. I was in town when Chris called and said the tiller was not working… He had removed the stabilizer bar and it did not like that. When we got home Beloved fixed it and away they went. Done tilling and the border frame in. I will take some pictures of the plants today and post those probably tomorrow. We got the garden spot tilled, and already I want a bigger one… We began it with a hoe and ended up renting a tiller. Our acre is on caliche, which makes great bricks… there is good soil, but it is mixed with the caliche. This used to be a cow pasture so I know the nutrients are in there. Chris had an awesome time mowing, he looked like a real farmer! He is also the one that did the tilling. We did not make the ground all smooth, but I think as a first garden this one will do just fine. We mixed in 10 bags of top soil. Beloved mowed the front at dusk, and loved using the headlights! So far I have planted, tomatoes of various kinds, green and red bell peppers, a jalapeno, green beans, cucumbers, zucchini, strawberries watermelon and canteloupe. Still to go in are potatoes, more straw berries (root starts) onions and… I forget what other seeds were begun… I think Judy knows. To be planted in pots I have Stevia, Dill and more Basil. I need more pots… We also planted a rose bush. I want more of those… I have a rosemary bush a friend gave me that I plan to put near the fence. My friend says it should help deter the goats from my yard… I am thinking of moving some iris at the base of any tree I plant too since they do not touch those when they get loose. I love the garden and I will especially love the fried zucchini and tomatoes, but man am I tired! Chris is going to town with me today because I was forewarned about a large shipment. I am glad he got a “real ” job so he can begin working on his own dreams, but man I will miss him when it starts! Well laundry needs beginning and the garden needs its morning drink. Y’all have an awesome day! The time has come… finally! We are beginning the work on the house this weekend! When he gets off work Beloved will go rent the power washer or sand blaster to strip the old paint off the house. We are also working on getting the yard cleared and ready for our… new yard tractor! After months of thinking, saving, and other research Beloved picked out a Husqvarna which is as I type arriving in my driveway! This afternoon ds and stbdil and I will work on putting in the raised bed garden. I will be taking some pictures this afternoon, of the garden progress, and what the house looks like now. I am so glad the time has arrived to begin the work! 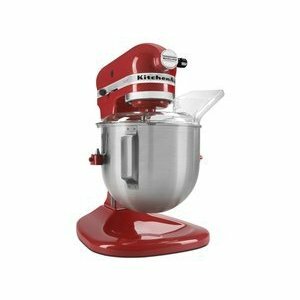 Kitchen aid! A Red one even! I am sooooooooooooo excited! We got ours at HEB. It was on clearance. I have wanted one of these for years and never would allow myself to spend the money. Beloved saw it as we were looking for the ice tea makers and said you are getting this! So she came home with us and I used her for the first time last night. I think I am in love. He also purchased Family Tree Maker Deluxe 2010 for me. Also a book I have wanted for years. A Patriots History of the United States . I am looking forward to reading this one. I love history! He definitely spoiled me. Plus getting the house worked on is something I have only dreamed of for years. Well I need to get back to home keeping. There is as always laundry to do and dishes to wash and dusting to be done. Plus today there will be gardening! Before I go, in other exciting news… DS got a job! He has not gotten his ours yet, they are waiting on his drug test results. He is going to be trained for a tech spot at Office Depot! Meanwhile other ds is being tested to become and on site tech. That means travel! He wants to travel so that is a good thing! Have an awesome day ladies! Today being Friday I will be busy at home until around 230. Then I will head to town for grocery shopping and such. My agenda today is laundry, grocery planning (the ads just got here yesterday!) and cleaning the kitchen. I am getting excited with making plans to fix up the kitchen. We are interviewing one more painter before we decide to hire or paint the house ourselves. I plan to take lots of pictures for the before during and afters. This weekend I also plan to get some plants for the front, and the stuff for the veggie garden. I bought some stevia seeds and plan to try them out. Both in pots (so I can grow it all year) and in the garden to be dried. I am also making a master shopping list. I have a sams membership my son bought me and plan to go there and really research what is cheaper there than HEB. If the kitchen, yard and painting were not enough chaos I plan to work on redoing the bedroom but on a much smaller scale. I will pack away or sell off most of the beanie babies and other plush. Take down the shelves on Beloved’s dresser and get new sheets and comforter set. The room right now is really crowded furniture wise and so my changes will be limited. I just want ti to feel like a calm oasis from the chaos of a small home with 5 adults living in it! Have an awesome and productive day ladies! Ok ok so anyway when I read a blog I meander through the links. Sometimes I find gems and add them to my blog role or bookmarks. Last week while reading my cousin’s blog I decided to recheck her list for anything new. I discovered a blog that just makes me think and enjoy. It is called down to earth. It is not about being a Christian woman. It is just daily life. The blog also has a weekly feature called you me and the kitchen sink. This is where she posts pictures and stories about folks and their kitchens from all over the world. I really like it. Today from that I discovered a happy blog about a young mom in Scotland. My paternal grandfather was from Scotland (by way of Canada) and I think Scotland is one of the most beautiful places on earth. Anyway I read the first post on this blog and it gave me a calm happy feeling. I do not know why. The blog is named Happy Doings. It is nice to relax and visit other folks at their boards and blogs. I love running the PH site but sometimes it is rewarding to sit back and not be the one to fix things. Though I do admit, the last year on PH has been pretty uneventful. Quiet even. No drama. I like that. I am not a drama person. I especially do not like the manufactured kind. Well I need to grab some paper to make sketches and make my lunch for work. Y’all have a blessed day! This has been noodling around in my head for a few weeks. I decided the whole deal needed further study. I went to the only true source of information on Christianity and following Christ, the Bible. I think the main reason this division bothers me is, biblically they are one and the same thing. To be a Christian, a real one, you must follow Christ. Regardless of religious rules this MUST be done because Christ commands it. One can say they are a Christ follower, or a Christian, that does not make it so. Doing good deeds does not make it so. Christ Himself says many will come to Him saying Lord Lord and listing all they did in His name, and He will say to them, depart I never knew you. So it is possible to do good, and not be Christian. Even though one is religious, even pious. So what is the difference between these rejected followers and the accepted ones? We all know the fruits of the Spirit in Galatians 5. Colossians 3 restates these. It goes on to say we must remove from our lives anger, greed, rage and filthy language. There is more but you can read that for yourselves. We are also told here that we serve Christ. One thing I know for sure and true. A Christian should never have to tell people they are a Christian. It should roll out from them like sweet perfume. People should recognize us for how we act, how we speak, how we dress. Our demeanor should be calm. A quiet spirit should be evident. We are not to be bossy. We are to be different. We will not look like everyone else. We will not act like everyone else. The modern religious church, all denominations, reminds me of Rev 3. The church of Sardis. People look at the churches and the people and think they are good. God has however declared them dead. They are doing their good deeds for religious reasons, for piety, not true service to God. Men only look at the deed done, not the root of it. God sees the root of it. What does it say that men who want to tear God from our grasp do the same deeds as many churches? What distinguishes them from the church? Please understand, I am not saying everyone who does good deeds is doing them for the wrong motives. I do not know the motives. I only know MY motives. God is the one who will judge the differences. Above all I have prayed and studied and come to this conclusion. This whole debate with its self righteous attitude, is from satan. He has orchestrated it to divide people, make them think they are missing something, to destroy good people by getting them involved in useless arguing. Titus 3 speaks of this. The fact is you can not be a Christian with out following Christ. You can not truly follow Christ with out becoming a Christian. To be a Christian means to follow Christ. He gave us work to do. Study His life. He was not all sunshine and pats on the head and free meals. He had anger, He had strength, He demanded things of us. Yes He saves us with a free gift, but He gives us a creed to live by also. He demands we work for our living, not expect charity, He expects that we take care of each other as we are able. He demands clean and clear values and life style. He demands that we remember that though we live in and work in this world we are no longer part of it. It isn’t enough to just say a prayer and have an emotional reaction. If we can truly state “for me to live is Christ” then we will be fundamentally and irrevocably changed. It can be no other way. If you claim Christ and yet those who knew you before and after see nothing different in you than from before, you are not true to Christ. Being a good person is not enough. Christ has to shine through you, and that makes you His. It sets you apart, it makes you a Christian, because then you are truly following Christ. It has taken me a long time to learn this. The closer I get to my Lord the harder I strive to make the difference apparent. When I was a child I was baptized. It was a big day… for everyone around me. I did it because I knew the Bible commands it. Not because I felt guilty about my life. I learned to study my Bible. The more I studied the more issues I had with the religion. It was not until a few years ago that I actually completely turned my life over to Christ. I finally after years of thinking I was a Christian, became one. I have noticed that the closer I get to the Lord, the more things begin to bother me. Bad language is one. I was raised by a mom who hung with a filthy language crowd. My Saturday nights until I was 10 were spent in taverns. Language did not bother me. Now it does. Even the mild forms of cursing have begun to make me cringe. I will not allow them in my home. In conclusion it seems to me the big deal in this is some one some where felt left out. They decided that to be a Christ follower you did not need “rules” Bibles were optional (see how many folks do not have one even in church on a Sunday) sloppy dress was ok. Everyone, even those in sin, should be welcome in with opened arms. Now take that image and hold it up to Christ. It does not fit. Christ lived by rules, He turned people away from Him because they did not serve Him with all they were. I do not think you need a suit and tie nor do I think you need to walk as if you have a stick up your backside. However you do need to give God and Christ proper respect and realize they are not only love and no discipline. Teaching they are only about love, acceptance and gushy feelings is wrong. There is in this as in all things balance. Treat your neighbor as you would treat yourself. Hold yourself accountable to God for everything. Give yourself wholly to God, hold nothing back. Let Christ shine through you. Do not stop to think how the world will think of you. The world’s opinion matters not, only God’s opinion is important. And do not be afraid of the Christian label. My energy level is coming back! Yesterday I went to work. When I got home I did my mile, worked on the huge disaster known as my kitchen, bowled with Chris (we use the WII) did more cleaning and fixed supper. I also grabbed miracle whip for Beloved and another angel food cake to use up my strawberries. Well I decided I need to eat real food before work so I made french toast, kinda like eggs, milk and toast all in one. I packed a lunch and off I went. I think today we could have stayed closed and no one would have known the mall was dead. Tonight will be roast with taters and carrots. At least I got laundry done before work! I had so much energy then… it fizzled at work though. Praise God, He is risen! On this glorious day may God’s peace fill your hearts. May you celebrate the risen Lord with love. Rejoicing in His perfect gift. Blessings on this day of days. Go with God my friends. Nothing says spring quite like iris and prairie grasses. Plus the gorgeous tiny wild flower. It all began on Thursday night. Beloved took me to supper at a place called Dickey’s Bbq pit. The food was awesome. The atmosphere was fun even though they are in a small regular shopping center. I think I want to go there next month for my birthday dinner if I do not choose to make something myself. Then Friday in the early morning we went yardsaling. It is nice for Beloved to have a day to do this. We grabbed some groceries to make lunch before… we all went to the movies! We saw Clash of the Titans and it was pretty good. After the movie we went and picked up my paycheck. Then we came home. Today we did more yardsaling. It is so nice! I had my yard sale list in my head and did not veer off of it too badly. I got a new canister jar, 5 skirts, they look never worn! 2 movies. (Under the Tuscan Sun and The Terminal .) I also got a large bucket of lace. I also bought 2 purses, a coupon holder and some pyrex and other mixing bowls. The pattern is not my first choice so they may find their way up for sale. All in all I spent about $15, and I got books too. I will talk about books more in a second. Beloved found a lot of computer stuff he wanted. Part of what made this week fun was I was asked to be part of a book round robin. This is like a letter round roubin but instead of recipes or what ever you send books. I got the books in last week, the Red River Valley series, books 1-3 The author is Lauraine Snelling . I must send these books on sometime this week. (Once I pick some one to send them on to) I hate to part with them. They are wonderful and I will be buying my own set. The second part of the set will be on it’s way to me once the lady is done with them. We went by Rita’s, the second hand book shop where I found some Grace Livingston Hill . Her books are getting harder to find. The trick for me is to remember what I have and not rebuy them! As a result of not doing that, I already have 2 duplicates that I will either put on ebay or in the PH mall. I also found another Lauraine Snelling called Ruby that looks interesting. Well like all good things, this weekend draws to a close with things still to be done. Laundry as usual awaits, dishes and dinners and such must be cared for. Before I leave off, please keep a lady I met this weekend in prayer. Her name is Marjorie Allison. She is 82 years young. She is spry and wonderful. She also has cancer. This week sometime will be her 5th and hopefully final chemo treatment. This lady along with her 89 year young friend was having a yard sale to help cover her expenses. She has some lovely pieces she wishes to sell, that would probably do well on ebay. I am praying on if that is where God wishes to direct me. She is beautiful and grace just shines through her. Apparently no on in her church uses ebay, or has the time to help her sell her items. Some how that hurts me. Have a glorious Easter y’all. Remember Christ has risen, and He is with us, in the midst!